Cozying up to Alexa, Amazon‘s voice-controlled Bluetooth speaker, was not going to be easy. Announced last November, the Amazon Echo first launched on an invite-only basis for Prime members – up until two weeks ago. The nine-inch tall cylinder is designed to be a personal assistant of sorts, helping answer simple questions, catching you up to the latest news, reminding you of appointments or shopping lists, playing music and occasionally telling jokes. The personal assistant portion of the Amazon Echo is the most important aspect to remember, as this is all Alexa can do for now. To get started with the Echo, all you have to do is plug it in and open the free companion app (iOS, Android or Fire OS) to begin the set-up. The colorful ring around the top of the Echo lets you know when you’re connected to Wi-Fi. Blue means it’s ready to go, and flashing blue means Alexa‘s getting ready to answer. The companion app has a voice training mode for you to get accustomed to things you can ask Alexa to do, such as set wake up calls or Wikipedia a subject. In my test, Alexa is fairly good at picking up your voice from within a medium size room, but sitting in front of a fan, her hearing tends to get jumbled. I found myself repeating commands several times that it was just easier to type on a laptop. The Echo also comes with an Amazon Fire TV-like remote, but I never truly found a use for it. Lastly, the Echo is wired, so you’ll need to keep it close to a power outlet. Amazon promises that the Echo does not listen in on your conversations, and I buy that. If you’re honestly worried about tech companies potentially spying on you, you probably would’ve dumped your smartphone ages ago. 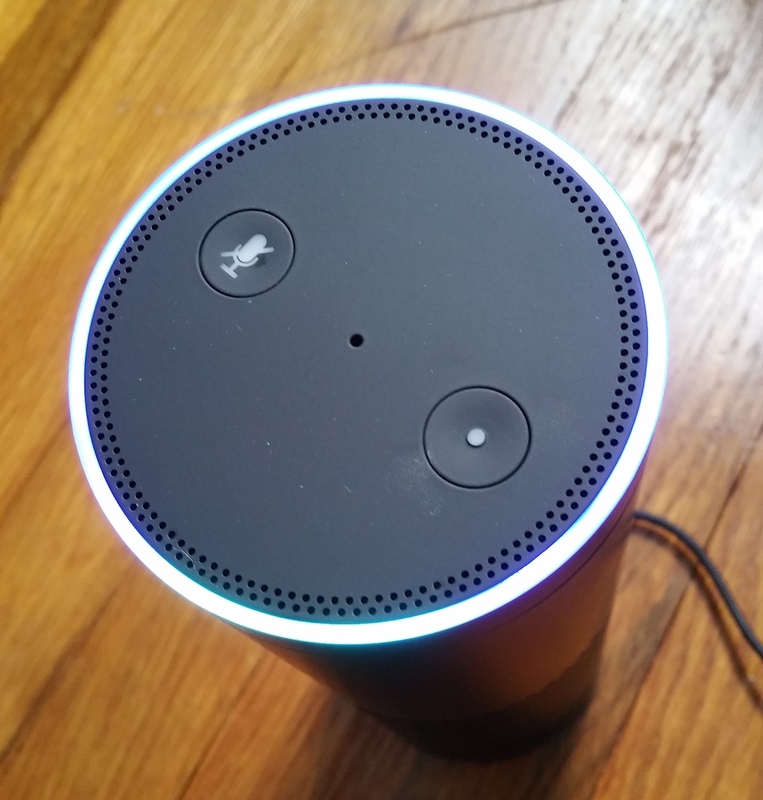 Additionally, the Echo will only respond after hearing the prompt “Alexa.” If you’ve got someone in the household with the same moniker, you can opt to call it “Amazon” instead. The company says it will be adding more wake words, but it would be fun if you were able to name your own. 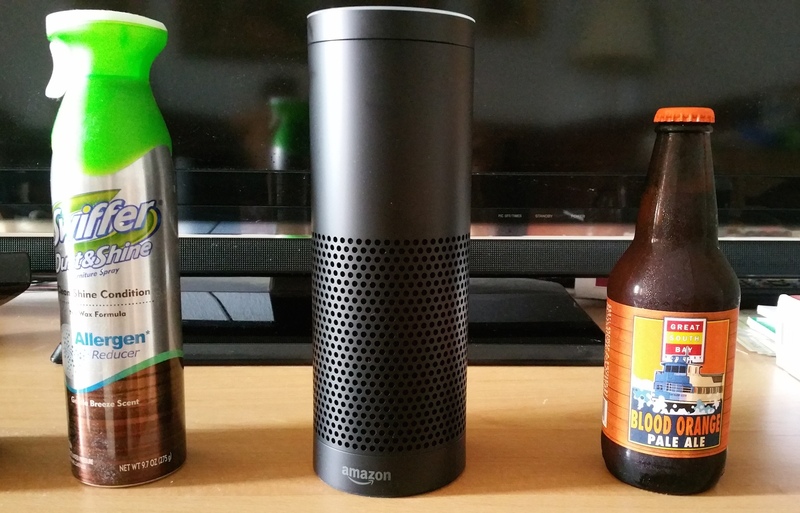 The Amazon Echo’s size compared to a few other household items. In my tests, I found the traffic update one of the most useful features. Just add your most frequented destination in the app and Alexa will tell you what the fastest route is and how long it will take. It doesn’t quite pull in your appointments from a calendar to suggest times to leave like Google Now, but it’s neat for spur-of-the-moment travel plans. Over the past few months, Amazon has also added several third-party integrations, such as IFTTT and WeMo. You can ask Alexa to turn the devices on or off, which is great for people with physical disabilities, and extreme couch potatoes. What’s not cool is the Echo isn’t integrated with Amazon‘s own products. It would be awesome if I could sync my Echo to my Amazon Fire TV and ask Alexa to open up apps or find content on my streaming device. The influence of Siri, Google Now, Cortana and the likes have gotten us pretty used to voice commands, so it’s easy to forget that not all personal assistant bots are the same. I use an Android phone and am accustomed to Google Now, so it was entirely frustrating when Alexa was unable to answer simple questions. 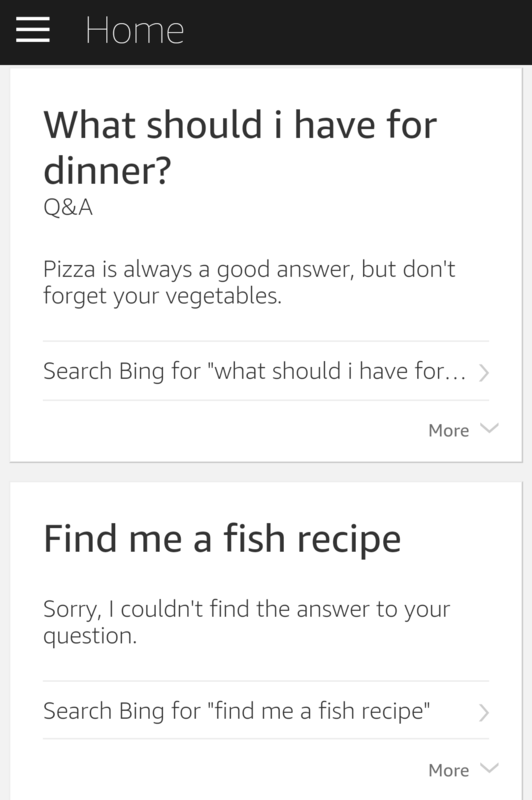 The Amazon Echo runs on the Bing search engine, so when it does not understand your query, it will occasionally ping Bing search results to your Echo app. Still, we all get into those moments where we discover something new and want to Google it. The fact that Alexa does such a poor job assisting here will be tough for the modern smartphone user to swallow. And while it seems like the Echo is Amazon‘s ploy to get more people buying stuff from Amazon, it’s actually pretty terrible at looking up products. I asked Alexa how much a Kindle Paperwhite costs and she responded cluelessly. 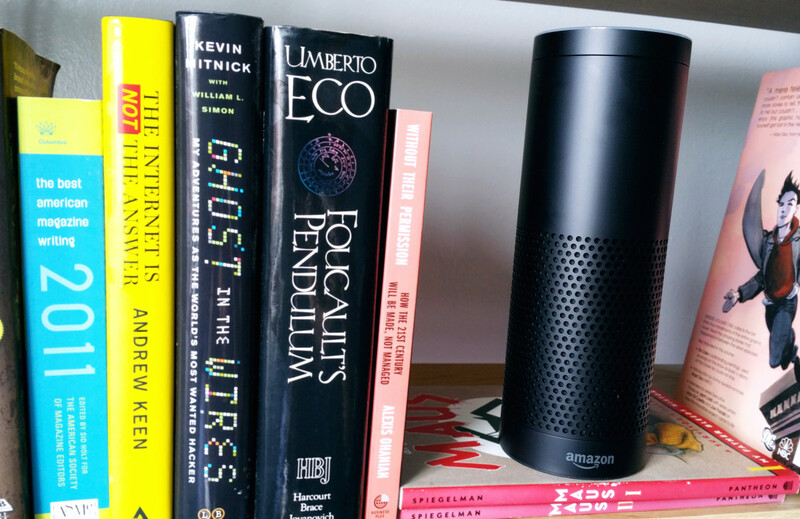 The Echo app does record everything you’ve ever told Alexa, so you can give Amazon feedback – or use it to incriminate your housemates if they’ve asked her something weird. Personality-wise, she’s got less bite than Siri, but has a few little nuggets to give you a chuckle. Tell Alexa, “I am your father,” for example to get her robotic, horrified response, or ask her for a joke for some third grade level nonsense. The Amazon Echo still feels very much like a beta product. I’m actually surprised the company chose to push the device out to public when the features are quite limited. While I’ve enjoyed using the Echo for weather and traffic updates, and the occasional radio or music play, the device still has some ways to go to compete with the voice assistants in our pockets. At best, the Echo is Amazon‘s proof of concept, and if Google gets in before further developments, it could be doomed. Hopefully, with the Amazon Echo SDKs, there will be more possibilities and better search functionalities in the future. But for now, I would hold off on buying what’s essentially a $180 Bluetooth speaker until it’s got more bang for the buck.